Expectations were always going to be impossibly high for director Kang Je-gyu’s (강제규) follow up to Taegukgi. The 2004 film was revolutionary at the time, combining kinetic war scenes, an orchestral score, and strong nationalistic sentiment through the (somewhat allegorical) story of two brothers divided by civil war. Yet after a seven year hiatus the director chose to return to the war genre, bolstered by an enormous 28 billion won budget and the return of Jang Dong-gun (장동건) alongside a cast of international stars. Furthermore, his project was to be based on the mysteriously true story of the discovery of a Korean soldier during the D-Day landings in Normandy, an event still unexplained to this day. Curiosity, and expectations, naturally increased. My Way (마이 웨이) continues the themes that have become a staple of the genre, including the notion of brotherhood and the brutality of war, albeit this time on an international scale. The grand scope and focus on historical events results in a lack of character development for the entire cast, and as such became a disappointment at the box office in Korea. 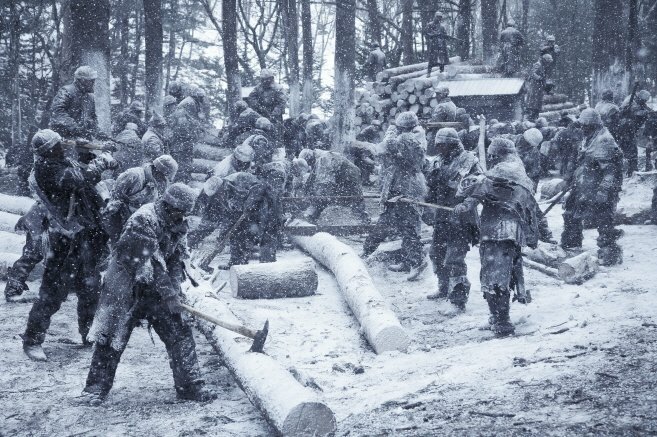 However My Way boasts some of the most gloriously horrifying war sequences from Kang Je-gyu, whose vision and stylization have notably evolved from his prior films. Yet despite the spectacle, the lack of characterization and emphasis on more personal, intimate conflicts amounts to an attractive but somewhat hollow war film. During the occupation of Korea by Japanese forces in the 1920s and ’30s, tensions are high on both sides with riots and assassinations commonplace. Despite the crackdown on the freedom of native Koreans, a rivalry emerges between two talented marathon athletes; a poor Korean rickshaw driver named Joon-sik, and rich Japanese student Tatsuo (Joe Odagiri). After Joon-sik wins a competition intended to prove the superiority of the Japanese, a corrupt ruling disqualifies the Korean athlete and rioting ensues. For their crimes, all involved in the riot are forced to become conscripts in the Japanese military. Sent to the frontline, Joon-sik and Tatsuo experience the sheer brutality of war on a variety of continents and through numerous armies, allaying their rivalry and instead forging the bonds of brotherhood. My Way is a stunningly realized film, recreating the landscape of 1930s Korea as well as Asian and European battlegrounds with incredible realism. The mise-en-scene is wondrous throughout the film and deeply absorbing, from scenes such as Joon-sik racing throughout the streets of Korea with a rickshaw, to a grueling winter imprisoned in a Russian concentration camp, to being caught in a crossfire involving the Nazis. The variety of events and landscapes are genuine highlights of My Way as Kang Je-gyu showcases his talent in recreating historical scenes with superb attention to detail, moving from one location to the next with impetus. The camerawork and frenetic action sequences are exquisitely brutal, genuinely conveying the horrific incidents soldiers were forced to endure and as the landscape and military units continually change such sequences never become tiresome or dull. 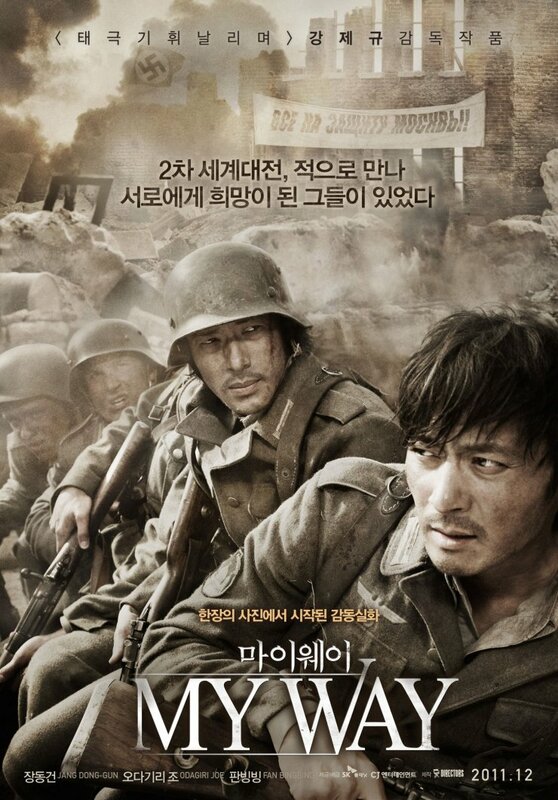 Yet therein also lies the greatest difficulty of the film, as while great emphasis is placed on moving the protagonists from Korea to Normandy the characterization is an afterthought, making the harsh war scenes stunning but without an emotional core. Joon-sik is very much the centre of the film, and while likable, has little-to-no reason to want to return home other than to continue running competitively. His journey is thus undermined, although his Korean compatriots suffer far worse as they are barely given an introduction before they are ruthlessly dispatched by the enemy in trying to create dramatic tension. The narrative does deserve credit for broaching the subject of brotherhood between Korea and Japan through Joon-sik and Tetsuo, attempting to convey a form of reconciliation and alleviating tensions between the two nations. But again, the pace of the narrative allows precious little space for their brotherhood to develop, which is of acute importance given their mutual hatred at the start of the film. As such the intimacy between Joon-sik and Tetsuo is (quite romantically) melodramatic and uplifting, yet also contrived. The narrative does however explore the interchangeability of bloodthirsty inhumanity during the course of the film, and the corruption that power seemingly inevitably brings. Given the tumultuous history between Korea, Japan and China, depicting scenes of Japanese brutality are certainly nothing new; however Kang Je-gyu portrays the forces not only as barbaric but downright fanatical as soldiers are ordered on suicide missions for the glory of the empire or shot upon retreat. What may seem like the stirring of Korean nationalistic sentiment is allayed by the contrasts with Russian and German troops, all of whom convey the same ideological stance during battles. My Way blurs the boundaries of nationality in conveying the merciless nature of warfare, portraying all parties as equally accountable. The representation of German troops is quite perplexing however, as the kind, relaxed and joyous soldiers stands in stark contrast to the annals of history. As Korean marathon runner Joon-sik, Jang Dong-gun (장동건) gives a highly capable performance although he is never stretched in the role. The actor conveys all the necessary emotions during the horrors of war and attempts to provide a heart to the film despite the limitations of the script. He is highly likable and attempts to shine a light of humanity during scenes of war as the narrative intends, but Jang Dong-gun’s presence is generally to give focus to the impressive battle sequences that rage around him. While battles commence on land, sea and air in spectacular fashion, the actor is usually running through the middle of the conflict giving scale and someone to root for as he takes the audience into the midst of war. Interestingly it is Japanese actor Joe Odagiri as student/marathon runner Tatsuo that has the greatest character arc in My Way. From angry student to fanatically patriotic military officer to brother, the actor gives a competent performance throughout although as with his co-star Joe Odagiri is not stretched in the role. The film is very much his story due to his character evolution, and provides an interesting counter-balance to those featuring Jang Dong-gun. As for famed Chinese actress Fan Bing-bing, it is a wonder why she choose to be part of the film at all given her incredibly short time on camera as Chinese sniper Sirai. She performs admirably, although she is ultimately just a device to spur the narrative forward. My Way is an incredible spectacle of a war film, with continually stunning sequences of war and featuring breathtaking cinematography in a variety of landscapes. 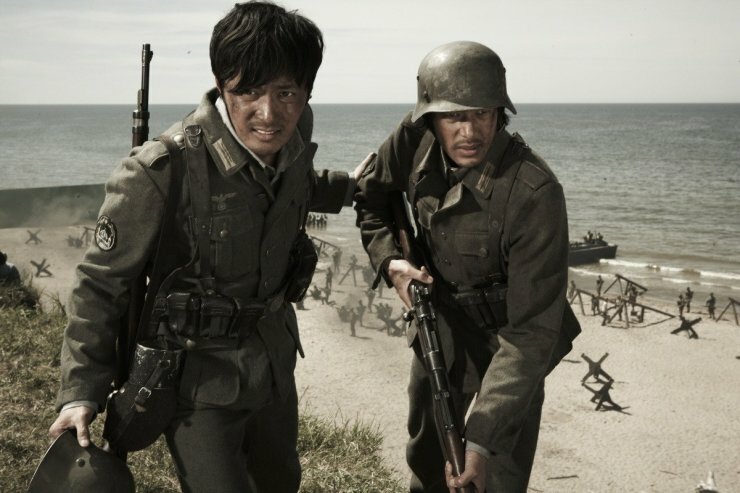 Director Kang Je-gyu has clearly used the enormous budget to produce some of the most effective scenes of battle in recent memory, with the scope and scale allowing his vision to evolve tremendously. That said, the focus on visuals results in a lack of characterization making the depiction of war rather deprived of an emotional core, and audience interest by extension. My Way is a visually impressive, although somewhat hollow, tour de force and a notable entry in the war genre.